Our best selling Solar Protective Moisturizer met our revolutionary new |ab-so-lute| minerals and voila - Moisture Tints multi-beneficial Beauty Balm was born! 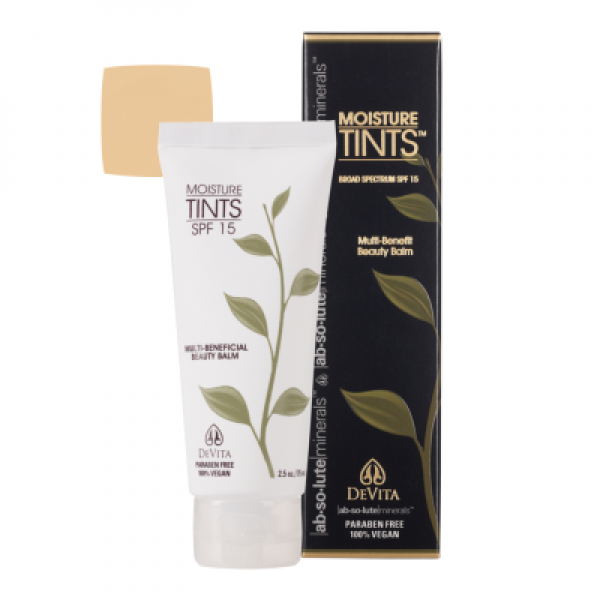 Our exquisite combination of active moisturizers and sun screen, plus enlightening pigments, and DeVita's signature age defying ingredients unite to create the most advanced one-step BB Cream (beauty balm) available - DeVita Moisture Tints. Your day just got better and faster with this all-in-one out the door look. Sun Protection + Natural Moisturizer + Tinted Coverage = Perfection. Just great, healthy coverage you can count on - absolutely... |ab⋅so⋅lute| minerals by DeVita. ACTION: Providing non-waterproof Broad Spectrum UVA/UVB sun protection to SPF15. DIRECTIONS: Using clean hands, apply as needed to cleansed/treated skin with light blending strokes until face is covered to desired look. Disclaimer: When trying any new products (DeVita or others), a patch test is always recommended. Choose a small area (inside of wrist, side of face back by lower jaw etc) for 2-3 days prior to fully using, especially if you have a history of sensitive skin or allergic reactions. Your skin is unique to only you - DeVita cannot guarantee that customers will not experience skin reactions to our products and cannot be held responsible should any occur. NO NANO TECHNOLOGY (average particle size is 240 nm) and offering broad spectrum UVA/UVB sun protection with an SPF of 15. Safe for sensitive skin, and Reef Friendly too. DeVita skin care products are 100% Vegan and Paraben Free. They are considered Gluten Sensitive Safe and never contain GMO's. DeVita products are never tested on animals (only humans!). ACTIVE INGREDIENT: Micronized Zinc Oxide 9%. INACTIVE INGREDIENTS: Aloe barbadensis (certified organic aloe vera) gel, Purified water (aqua), Capric/caprylic triglycerides (derived from coconut oil), Glycerin (vegetable), Iron oxides, Pomegranate extract, Japanese green tea, Hyaluronic acid (vegan source), Glyceryl stearate SE (derived from vegetable oil), Stearic acid, Lecithin phospholipid, Tocopherol (vitamin E), Allantoin, Vitis vinifera (grape) seed extract.